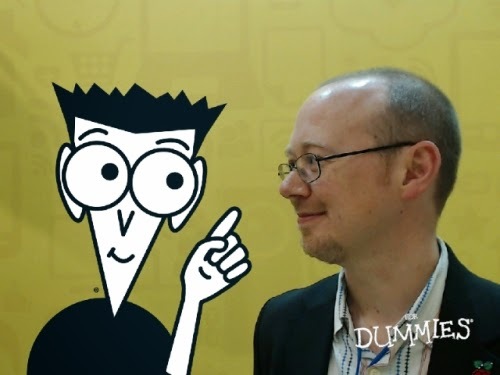 Sean McManus's Writing blog: What's new in the second edition of Raspberry Pi For Dummies? You are here: Home > Blog Home > Sean McManus's Writing blog: What's new in the second edition of Raspberry Pi For Dummies? What's new in the second edition of Raspberry Pi For Dummies? Later this month, there is a second edition of Raspberry Pi For Dummies coming out. A lot has changed since the previous edition was published in March 2013, including the launch of the Model B+ earlier this year and the introduction of NOOBS, which makes it easier to install the operating system. For this second edition, Mike and I have checked and updated the whole book to account for the new hardware and the latest software. We've also refreshed the list of inspiring projects and useful software at the back of the book with some new suggestions. Me having a quick editorial meeting with the Dummies Man. Making a Minecraft Maze with Python: This project shows you how to make a program in Python that will generate random mazes that you can walk around in Minecraft. It's a lot of fun exploring the mazes, and they don't have to be very big before they become quite challenging to solve. You can easily configure the size and position of the maze if you want to drop it into an existing world, but be careful because the program will wipe out anything in its way as it builds the maze. This chapter previously appeared in the book Raspberry Pi Projects, but since that book is for a different audience, and I got really great feedback from people who saw the program in action, we thought it would be good to include this chapter in Raspberry Pi For Dummies too. You can watch a video of this program building a maze here. Making music with Sonic Pi: Sonic Pi is a programming language you can use to write music. In this new chapter, you'll learn how to use it to write tunes you know, random music, and sample-based pieces. The chapter finishes with an industrial piece that combines samples for drums and several synth parts that are synchronised together. I'll post the music on this website soon, both as code and audio. RISC OS: This is an alternative operating system for the Raspberry Pi, and it now has an appendix of its own that provides a short introduction to get you started. We've extended the page count (at the same RRP, so you get better value! ), but something had to give, so the chapter on making a website using the Raspberry Pi has been removed. If you'd really like that chapter, the first edition of the book remains on sale with immediate shipping in many places, including Amazon. The second edition of Raspberry Pi For Dummies is available now for pre-order at Amazon.co.uk and Amazon.com, with Amazon's pre-order guarantee ensuring you'll pay the lowest price Amazon lists it at between now and publication day. Visit my shop for links to other places you can buy Raspberry Pi For Dummies. The second edition is only viable because the first edition was well received, so I'd like to thank everyone who read the first edition, bought it, reviewed it, and/or helped to spread the word. All your support is very much appreciated!